The genus Oncidium is a large, recognizable group of tropical orchids, containing approximately 330 species. 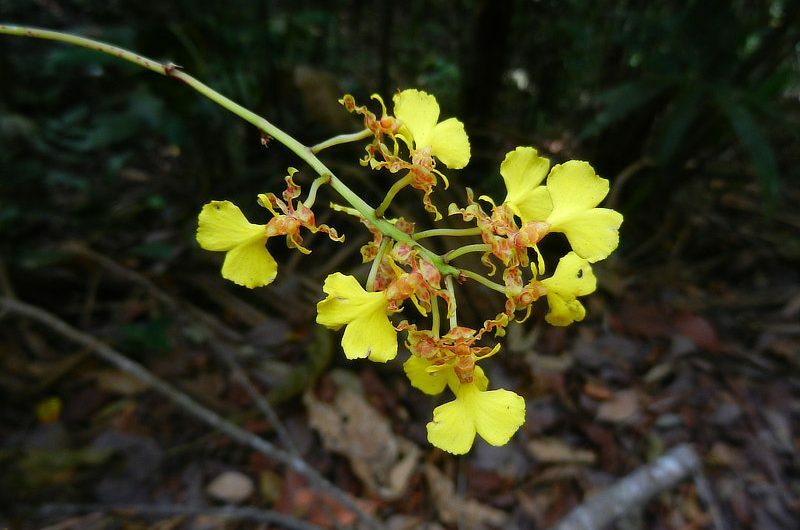 This medium-sized, epiphytic orchid is found in the lowlands of Panama and possibly Colombia. The Yellow Dancing Lady has small cylindrical pseudo bulbs enveloped by 4-6 papery sheaths and a single, longitudinally grooved, fleshy leaf 24-70 cm long and 1 cm wide. The beautiful inflorescence consists of a single bloom stake extending horizontally from the base and terminating with many yellow and reddish-brown flowers up to 2.5 cm in length, shaped like a dancing woman wearing a fancy flamenco dress. This orchid blooms in the dry season (January – April) in the shady lowland rainforests around the Canopy Tower and Canopy Camp Darien. Pollination: Oncidium stipitatum is pollinated by a bee of the genus Centris.